Abstract: INTRODUCTION: It can be a challenge to coalesce highly stable water-in-oil droplets in the presence of stabilizing surfactants, especially using fluorosurfactants that couple oligomeric perfluorinated polyethers (PFPE) with polyethyleneglycol (PEG) in fluorinated oils (EA surfactant) . Currently, coalescence methods for bulk droplets require the addition of perfluorooctanol or perfluorobutanol to displace the fluorosurfactants at the interface of the droplets thereby reducing the aqueous surface tension . This abstract describes a simple method to coalesce bulk droplets into a larger water reservoir by electro-coalescence. EXPERIMENTS/RESULTS: Droplets containing 1mg/ml BSA and 1µM fluorescein dye in PBS were prepared in the HFE (Novec) 7500 engineering fluid (oil) with 1% EA surfactant and shown to stable at the interface of the oil and excess water (Fig. 1a). A high voltage (~2100 V, 50kHz) was applied for a duration ~20 s, which coalesced the droplets with the water (Fig. 1b). Based on that, a systematically evaluation of the completeness of the droplets coalescence under different magnitudes of voltages and duration times was performed. 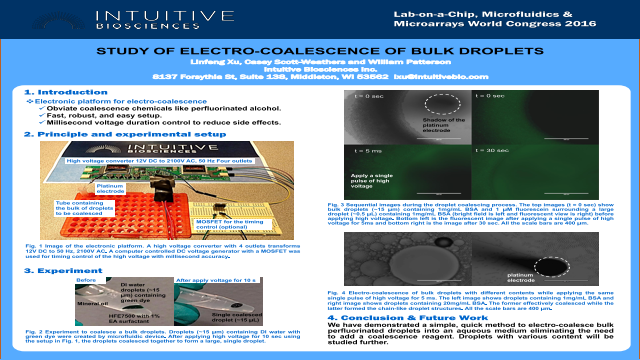 Moreover, droplets with different components were also studied to find out the minimal required voltage and duration time for complete coalescence. CONCLUSION: We have demonstrated a simple, quick method to electro-coalesce bulk droplets into an aqueous medium obviating the need to add a perfluorinated alcohol. Summary: This abstract describes a simple method to coalesce bulk droplets into a larger water reservoir by electro-coalescence. References: 1. Holtze, C., et al. "Biocompatible surfactants for water-in-fluorocarbon emulsions." Lab on a Chip 8.10 (2008): 1632-1639. 2. Akartuna, Ilke, et al. "Chemically induced coalescence in droplet-based microfluidics." Lab on a Chip 15.4 (2015): 1140-1144.